I grew up with a father who loved taking photos of his family. I learned from him to see the beauty in even the smallest things. One of my greatest joys is sharing this beauty with others. My photos were taken with my Canon Rebel T2-i, T3-i or my cell phone. The first camera was bought because I started a photography business, Creative Lens Art By Melodie, (later changed to Photos by Elaine Estes) in 2010. I had many opportunities during this time. I served as a photographer for the local chamber of commerce and was hired as a photojournalist for the local newspaper. My photos of Fuquay-Varina were used in advertising for a new development nearby to advertise the area by a major marketing company. Several of my photos have been used in an article in the Raleigh News and Observer. My experience also includes shooting twice for Relay For Life and once for Out of the Darkness, an organization providing support for families who lost a loved one through suicide. Photographs of animals from my escapades to different places including Busch Gardens, Virginia Marine Life Zoo, and Asheboro Zoo are in the album as well. Scenic photos from Germany, Switzerland, Chicago, Washington, DC, Virginia, North Carolina and my home town, Greenville, South Carolina can be seen as well. I hope you will enjoy viewing the pictures as much as I enjoyed photographing them. I enjoy capturing smiles and facial expressions of surprise and joy. I will also have a large number of photos of cats, dogs, birds, insects and animals because everything has its own beauty and life to live. So much beauty and so little time to see it all! What don’t you consider posting your work at the Senior Salon#10 on Wednesday? You would be a real asset. Thank you, I would love to! I already follow it, what do I need to do and what kind of blogs do they like? Can I use previously posted blogs of mine or do they need to be new? When I open the Salon on Wednesday you will find an INLINKZ FROG at the bottom of the post. Tap on the frog and fill out three informational lines and then you can post as many of your posts as you would like. I look forward to reading and seeing your posts on Wednesday. Roads and paths are my favorite. They engage my sense of wonder. Where do they lead? What kind of adventure might I embark on if…? What will I see, hear, feel once I…? My beloved Mother would always say that curiosity killed the cat. But…I’m not a cat! Oh thank you for completing this old saying for me. My mother never mentioned this piece. She may not have put it together. Very cool. I just experienced an A-ha moment on a Tuesday night. Lol! Glad to help. I doubt that part came out the same time as the first part and it may be a Southern expression too. I will have to look that up! Thanks!! 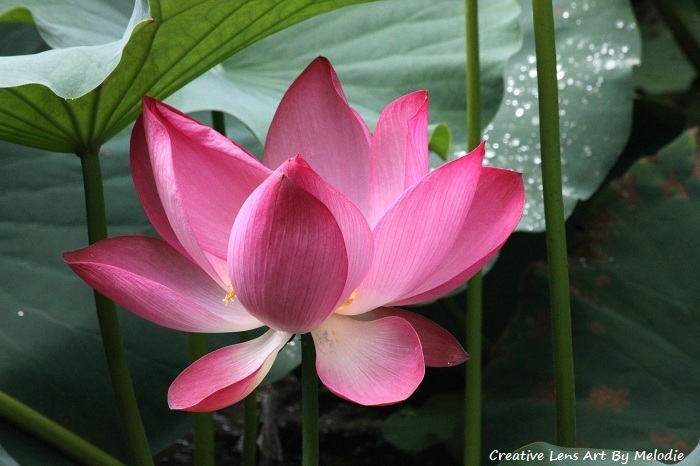 The Pink Lotus is beautiful! I love photography – I take pictures of anything and everything! Thanks for sharing. Thank you, KB!! I have thousands of pictures from beautiful things, sites, people, flowers, cats, birds, etc. I still can’t help myself when something amazing appears. Keep up the joy and love of beauty and sharing it! Thank you!! So glad you liked the lotus.